In July, 1987, several quilters who also worked during the day decided to split off from the Sew-N-Sews to form an evening group. 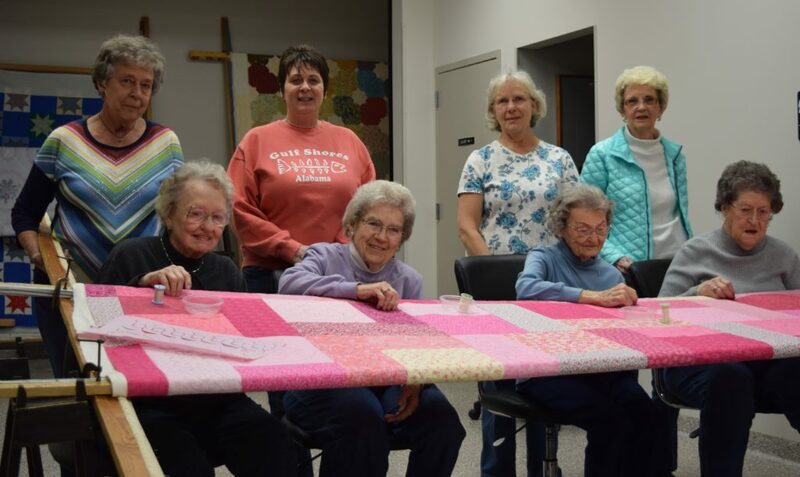 They chose the name St. Ann Quilters and meet on Monday evenings from 6 – 9 p.m. Current members are Marilyn Deeken, Brenda Engelbrecht, Dorothy Haller, Janet Kremer, Lucille Krummen, Barbara Martin, Betty Schrimpf and Shirley Stieferman. Lucille and Betty co-chair the group. The group has worked on quilts for people in Michigan and had calls to quilt for people in Oregon and Idaho. The charge is $1.00 per hour. St. Ann‘s makes an annual donation to the pastor for use in the parish.